If you only broke the main leaf just put in the new leaf using the rest of the stack. Should be fine. At least to get you going. I had same failure years ago and all they had was the single main leaf. Re strapped the old stack and it lived one in the unit for 10 yrs and traded. Good luck. Spoke to a dish customer care case manager , she said she specializes in the service tough issues and they track and make recommendations to fix things. I guess. 🤔 She also works the RV side of Dish support. Was very familiar with the Hopper and traveler setup. Told me she’s has spoke with many people with the same issue in homes as well. Even her home Recommends activating Prime Time Anytime and not set each show on networks if you tape a lot. We do. Said the timer can get corrupted easily and cause a software issue and conflict which puts a reset in place. The multiple ones are caused by the conflict not clearing on the reset. So far after 3-4 days of setup like this we have not seen the issue return She said if we do see it disconnect the coax from receiver and reconnect it usually stops the repeat reset that time She also said in DRV then prime time then timers at top review them if any stuck in there then delete them they can cause issues I did have one from a month ago that was there that shouldn’t have been Maybe this will help someone else. Thanks Zulu for the tip! It worked. Now have 129 connected and green. Channels that were SD now are HD like normal. Appreciate it! We also are on res acct with H3 and 2 wireless Joeys. We have been calling and going thru to tech support to change locals and so far it works ok. But I might try using chat as others say it’s simpler and no extra talk about being in RV. Still no trouble. Yes DPH 42. I have not done that. I will try that today! Thanks. This is reposted with more info Sorry for the second post should have added to last one Hoping someone has some help on this. We occasionally have the Hopper 3 shut down and come back with the following error box 1599 Your receiver is running a system check and will reboot shortly when this happens it reboots and picture returns in about 3 min or so only to have it happen again in 20 seconds or so. This repeats from 5-15 times. Various times of the day. Evening time being most prevalent Dish sent two hoppers already. Tech support no help. Anyone have a solution? 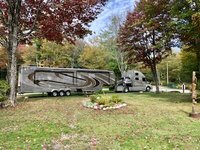 Nashville KOA by the Opryland Hotel area no issue for our rigs. Like David we got Truck 40’ fiver and Smart with at least 10’ to spare. Access roads are good as well. This KOA was forced to completely rebuild with new layout about 3-4 years ago after a major flood. Modernizing things. Dish tech verified power source was good (as it was) then replaced with new Hopper. He said he saw this once before and replaced. Now transferring recordings Hopper to Hopper. We upgraded the other day to the Hopper 3 and after two days of normal operation this AM it started to go blank no msg. Then restart. After about 2-3 min it showed programming. This repeated all day. I tried a reset, power cycle, different power source and at Dish tech support request a partial reset. It continued, unplugged it for several hours. Powered it up again tonight and it’s staying on so far. Using DVR to watch and programming seems to be available too. Dish tech coming in AM. Maybe replace it? Anyone have any thoughts ? Just upgrading to H3 wonder what disconnect you refer to ? Power removed? Any other suggestions for travel? Oasis like chad said. Great huge pull thru sites. 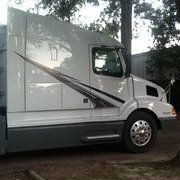 We stayed there with HDT rig 65’ no issue. 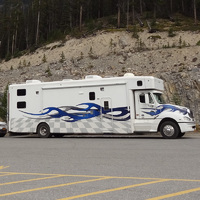 Also stayed at Sams Town (now a KOA) and fit the large sites.